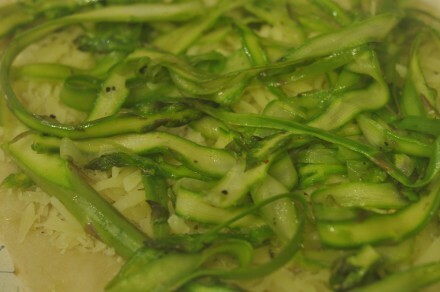 I wrote about Smitten Kitchen’s Shaved Asparagus Pizza in my recent round-up of asparagus recipes. Since then, I’ve been somewhat compulsively returning to the Smitten post to look at the photos, which are simply mouth-watering. Deb — the cook, writer, and photographer behind Smitten Kitchen — shaves the asparagus with a carrot peeler and then seasons the long ribbons with olive oil, salt, and pepper. She tops the pizza crust with a bit of parmesan cheese and some mozzarella and then piles on the asparagus. Ten to fifteen minutes in the oven and a sprinkling of scallions and it’s ready. The Cook truly appreciated the simplicity of the recipe. Shave. Season. Sprinkle. Done. The Professor’s favorite homemade pizza, in contrast, is topped with grilled shrimp and kale-walnut pesto. It’s a Professor-approved, A+ recipe. It’s also ridiculously time-consuming and The Cook sometimes feels that she’s getting one meal for the price (and effort) of three. Even a simpler pizza with wild mushrooms and, for The Professor, chicken sausage requires cooking two toppings and cleaning two pans. Of course, The Professor’s grading system doesn’t account for the easy-speediness of preparation. 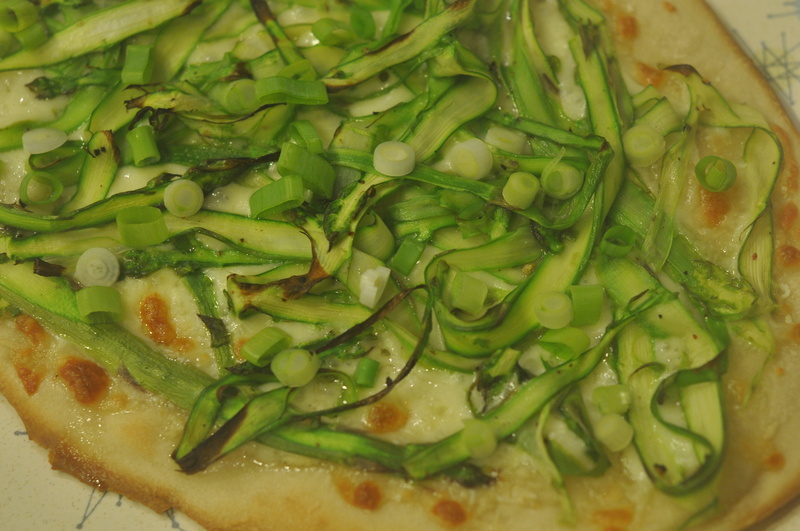 And I am quite sad to say that the Shaved Asparagus Pizza earned a flat B. It was, he said, “perfectly tasty. And it looks great.” But it left him wanting. “But isn’t that what pizza is — bread, tomato sauce, cheese? With maybe a little bit of meat sprinkled on top?” I countered. “Yes, but there is meat,” he replied. Because The Professor did like the flavor and texture, he thought it would work well as a first course for a dinner party. An interesting, seasonal appetizer. And I will try that, if only because I am looking forward to my next Shaved Asparagus Pizza. You can see the recipe here. Stick to the recommended amount of mozzarella so that the flavor of the asparagus really comes through.